I decided to dust off my childhood Turbo Duo, I recapped it. The CD drive has not been working so I disconnected it until I could figure it out. I was able to play a few card games, once I was satisfied that it was working I walked away with it left on for an hour. When I came back the screen was just a massive glitch. After turning it off and on the screen on time is delayed, and there is only a white screen. The CD bios also no longer shows, so this is with or without a game in. I also re connected the CD drive just to see what would happen. The drive is pretty much acting mostly the same as it did when it was connected, the laser is bouncing all over the place. I went over the board with my camera phone zoomed in, looking for debris or anything else. All looks good. I don't know what happened. Oh boy. Okay I found something. 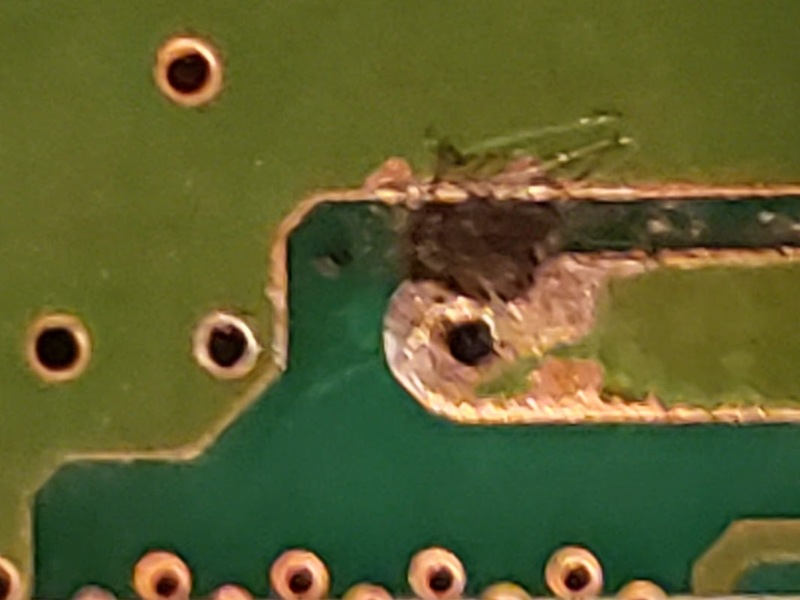 I was able to smell the board burning and noticed that two vias were smoking. 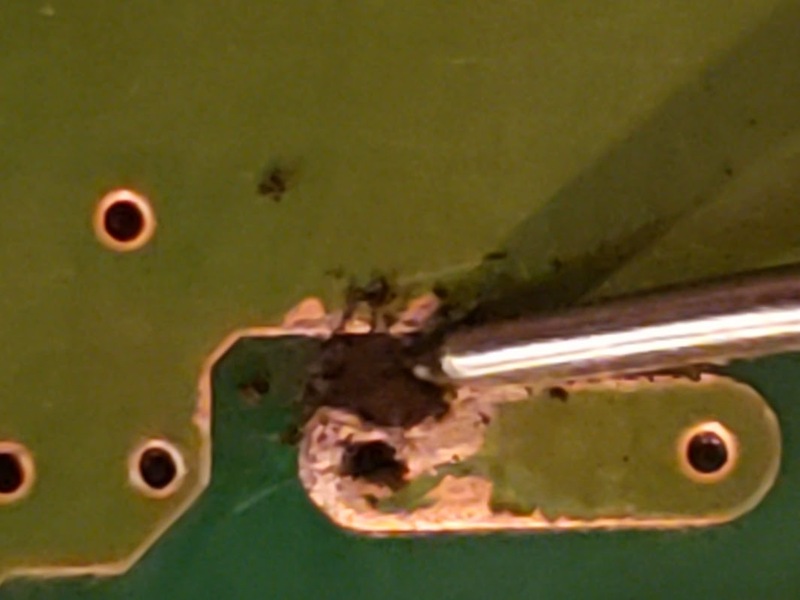 I could only see the one side of the vias as the other side was covered by the large chip, I assume it is the main CPU, but I dont know. 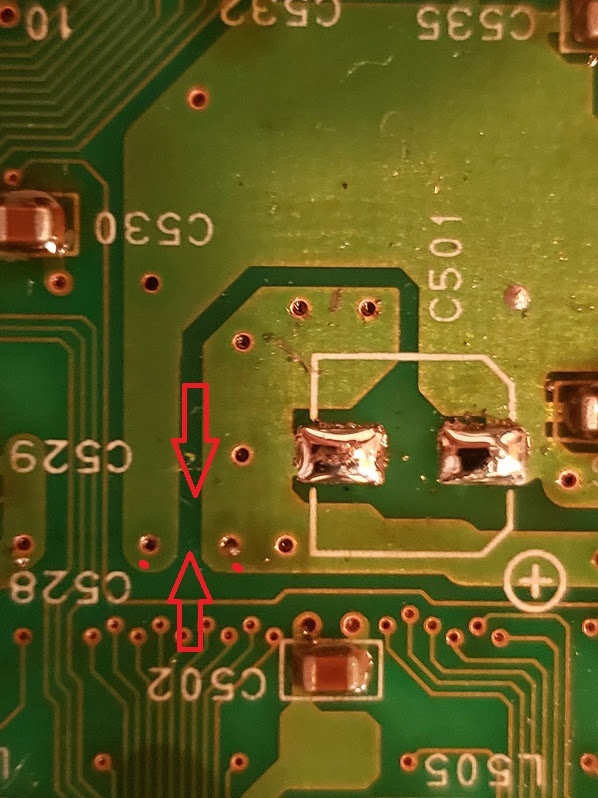 The vias that were smoking are marked with red dots. They were passing the smoke that was from the burnt area between the two traces to the visible side of the board. I plugged the board in, turned the switch on and that area visibly lit on fire. I flipped the board over to the cap side, I marked with arrows to where the scorch mark is on the other side. 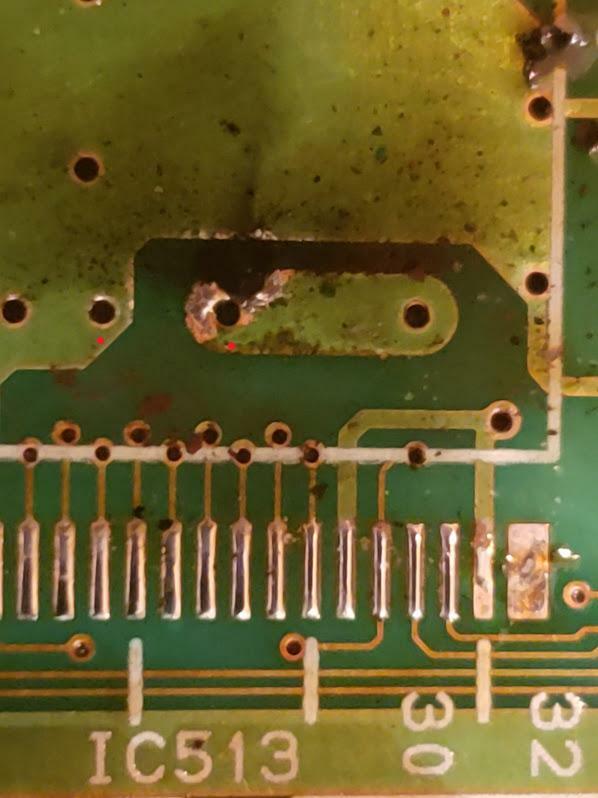 I put dots on the vias were I originally saw the smoke. I measured resistance between the two leads of cap C501 and got around 300-350 ohms. I also removed the cap and measured the pads, same 300-350 ohms. I do not know if this is a correct value, but most caps seem to have no continuity between pads. Could there be a short between the layers that is 300 ohms, and would that cause it to light up? What do I do at this point? Do I keep digging out the scorched spot? I was using a multimeter. Anyway after digging and cleaning I was able to remove the 300 ohm short. I replaced the IC and that fixed the issue. ah ok, glad you got it repaired! Turbo Grafx 16 CD SYstem - White Screen Question?